During the coldest, grayest time of year, we often find ourselves scurrying between the front door and the driveway, shoulders hunched, face buried in a scarf. Consider how different that brief walk could be if a shrub in full bloom sent us off smiling in the morning and welcomed us home at night. Winter-flowering shrubs are hardy, tolerant, and easy to grow if given full sun to partial shade and good, well-drained soil. They tend to bloom from January to March; many can shine all season. The exact timing varies, based on an area's climate and the vagaries of the particular year (warmer temperatures lead to earlier bloom). Although these attractive shrubs add much-needed interest to the winter landscape, they aren't widely grown, largely because no one visits nurseries during the gloomy months, when the shrubs are at their best. And when the time comes for spring planting, they sit unnoticed beside the showy bloomers that shoppers love. 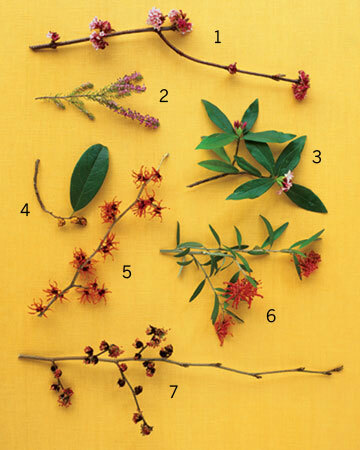 Some of the best options for winter color and fragrance are obscure members of well-known families, such as honeysuckle or viburnum. Winter honeysuckle (Lonicera fragrantissima), for example, is just as fragrant as its spring- or summer-blooming relatives, but it bears its pure-white, exquisitely perfumed flowers months earlier than they do. Other winter shrubs are exclusively late-season bloomers: Witch hazel (Hamamelis x intermedia), with its lightly scented, streamerlike flowers, is probably the best loved of all. 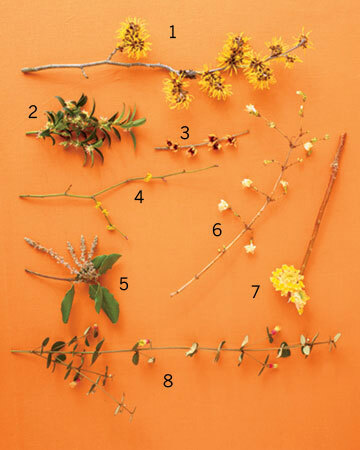 These shrubs comprise dozens of species and cultivars, in colors ranging from the butter yellow of paperbush (Edgeworthia chrysantha) to the coral red of royal grevillea (Grevillea victoriae). Tempting as it is to choose based on color alone, make sure to pick the right-size shrub for your garden. Some small plants behave almost like ground covers: Winter heath (Erica carnea) and winter daphne (Daphne odora) can be planted under the high canopy of a tree or tucked into a bare spot in a perennial border. Most winter-flowering shrubs are medium size. Witch hazel and silk tassel bush (Garrya elliptica) can grow to a height and width of 15 feet, which makes them exceptional specimens. If you have a lot of space, Persian ironwood (Parrotia persica) is the perfect four-season plant. Reaching up to 40 feet tall, this witch hazel relative graces winter with tiny red flowers cradled by rich-brown velvety bracts, sails through spring and summer with glossy foliage and spotted bark, and greets fall with lavishly colored orange and red leaves. Whichever shrub you choose, place it carefully. With deciduous types in particular, such as witch hazel and fragrant wintersweet (Chimonanthus praecox), you may want to emphasize the floral effect by situating the plant against a background of evergreens. 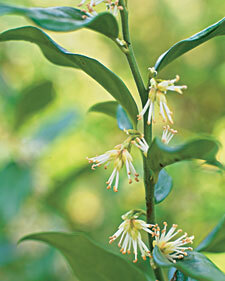 Put a fragrant flower, such as sweetbox (Sarcococca hookeriana), near the house, where it can be seen and smelled through its bloom period. Come spring, after you've selected an interesting new shrub and planted it in the perfect spot, you might even find yourself looking forward to winter. Light up the landscape and prepare the way for spring sunshine. 1. Witch hazel (Hamamelis sp. 'Westerstede' shown) Its streamerlike petals unfurl in the warmth, releasing a fresh scent. Hardy from Zones 5 to 8, the shrub can grow 10 to 15 feet tall. 2. Sweetbox (Sarcococca hookeriana 'Humilis') This suckering four- to six-foot shrub has fragrant white flowers set against evergreen foliage. It flourishes in Zones 4 to 7. 3. Fragrant wintersweet (Chimonanthus praecox) A sheltered situation will protect these small, deliciously sweet-smelling flowers from harsh weather. 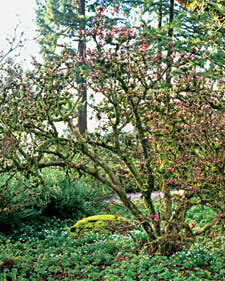 The shrub can reach 15 feet in height and is hardy in Zones 6 to 9. 4. Japanese spicebush (Lindera obtusiloba) This offers cheery flowers in late winter, excellent fall color, and scented foliage. It can grow up to 12 feet tall and is hardy in Zones 6 to 9. 5. Silk tassel bush (Garrya elliptica) When in bloom, this evergreen appears to be festooned with streamers. Hardy in Zones 7 to 10, it can grow to 15 feet. 6. Winter honeysuckle (Lonicera fragrantissima) Hardy in Zones 4 to 8, it produces perfumed white flowers from January to March. For summer interest, grow a clematis through its branches. 7. 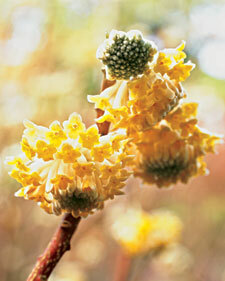 Paperbush (Edgeworthia chrysantha) This exotic plant is becoming mainstream in Zones 7 to 9. It bears clusters of aromatic yellow flowers followed by large, glaucous leaves. 8. Australian fuchsia (Correa sp. 'Marion's Marvel' shown) A three- to six-foot mounding shrub, it bears bicolor flowers from late winter through spring. It's hardy through warmer parts of Zone 7; in cooler areas, grow in a container and protect during cold snaps. Bring romance and charm to the winter garden. 1. Bodnant viburnum (Viburnum x bodnantense 'Dawn' shown) This shrub bears clusters of fragrant pink flowers all winter and can reach 10 feet tall. Although the plant is hardy in Zones 5 to 8, its flowers will wither in extreme cold. 2. Winter heath (Erica carnea 'December Red' shown) Give this sprawling little shrub moist, acidic soil, full sun, and a cool climate (Zones 4 to 7) and it will be covered in white to red flowers in the winter and early spring. 3. Winter daphne (Daphne odora 'Leucanthe' shown) Clusters of sweetsmelling, waxy flowers in white to pink top its neat, evergreen mounds. Grow in Zones 7 to 9; despite the plant's reputation for unreliability, it's so lovely that you'll want to persevere. 4. Chinese fig hazel (Sycopsis sinensis) This pretty evergreen shrub bears unusual yellow-red flowers. In Zones 7 to 9, it can grow to 12 feet. 5. 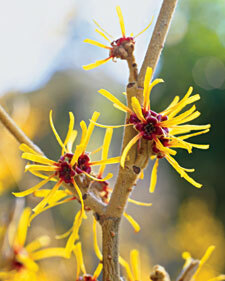 Witch hazel (Hamamelis 'Diane' shown) The best red-flowering witch hazel, though not as fragrant as yellow varieties. It can reach 20 feet tall and is hardy in Zones 5 to 8. 6. Royal grevillea (Grevillea victoriae) This five-foot-tall Australian native will bloom from October through April in Zones 7 to 12. It requires full sun and dry conditions during periods of heat. 7. Persian ironwood (Parrotia persica) This shrub is actually a small tree, reaching 40 feet, but it can be grown as a large multistemmed bush. The small but bewitching flowers are notable for their rich-brown bracts and maroon-red blooms. Striking spotted bark and vivid fall color make Persian ironwood a stellar choice for full sun in Zones 4 to 8.